Tayal Tour & Travels regularly organizes Rafting & Camping trip for adventure enthusiasts. Some of the most popular Rafting & Camping destinations thronged by adventure sports lovers include Kaudiyala, Marine drive, Shivpuri and Rishikesh. 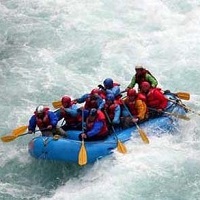 White Water Rafting is a very safe sport where there is one instructor & one rafting guide provided on every raft. A raft is capable of carrying up to 6-8 rafters at a time. All rafters have to wear full safety gear which includes safety helmets and life jackets. Before the rafting trip is started, the instructed conducts a brief session regarding the safety doâ��s and donâ��ts. White water rafting can be done by anyone between the ages of 13 to 50. Other than rafting, travelers can also indulge in mountain biking which is done in Mohanchatti in Rishikesh. Shivpuri offers opportunities for indulging in adventure sports activities such as Rock climbing, canoeing, rappelling, valley crossing. Marine Drive, located 27 Kms from Rishikesh, offers opportunities for those who want to indulge in Slithering or Bridge fall.